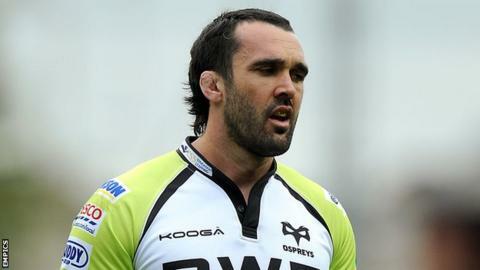 Worcester Warriors have signed Jonathan Thomas from Ospreys following the termination of the Wales international flanker's contract a year early. The 30-year-old leaves Ospreys as their club record appearance holder, having played 188 games for the Welsh region since their inception in 2003. He has also been capped 67 times by Wales, scoring seven tries. "I came up to meet Dean Ryan about six weeks ago, and the club blew me away," Thomas told BBC Hereford & Worcester. "I haven't played at Worcester since 2007 and so much has gone on in that time. "I just saw great potential and, together with Dean Ryan, who is widely regarded as a highly-respected coach, I think it's the right move at the right time of my career. "I was looking for a fresh challenge, and I think Worcester would be perfect for me." Warriors director of rugby Dean Ryan added: "We're delighted to secure a player of Jonathan Thomas's quality. "Jonathan is an extremely loyal and dedicated individual, underlined by the fact he has always been a one-club man with Ospreys. "However, a new challenge at Warriors at this stage in his career is one that excites him." A member of Wales' Grand Slam-winning teams of 2005 and 2008, Thomas becomes Warriors' 10th addition for the new season. He is Ryan's second signing since replacing the sacked Richard Hill, following Chris Brooker's arrival from Harlequins.